With this series Kai wanted to combine the typical Japanese Santoku knife with the classic European kitchen knife. The blade is constructed from a central core made of extremely hard steel VG-MAX (61 + -1 HRC) coupled with two 32-layer damask steel cheeks. The surface of the blade is reminiscent of raindrops - which is the meaning of the Japanese word Minamo. The glossy finish of the blade highlights the very fine grain of Damascus. The black pakka wood handle is impregnated with phenolic resins and polished by hand. Thus providing the highest sharpness, long cutting durability and ideal performance. With its understated elegance, the Shun Minamo series joins the ranks of premium class Kai knife series. An artistically combination of both Japanese and European features. Tim Mälzer's idea was to create a synthesis of the typical Japanese Santoku and the classic European chef's knife. This fusion was the base for the three blade shapes. The series is designed with a clear stylistic idiom. The combination of the black wood hilt together with the specifically designed blade and its evenly damascene pattern, lets every knife look like an individual item. 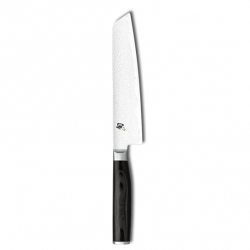 The shun Minamo classic paring knife is a must-have for every kitchen. in a way, you can think of it..
Тhe shun Minamo utility knife is a must-have for every kitchen. in a way, you can think of it as the..